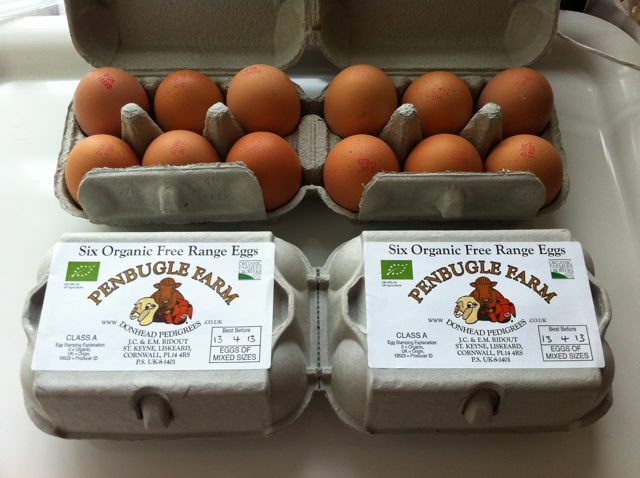 Some of you may have noticed that I have been using Penbugle Farm organic eggs in some of my recent bakes. Keen as I am to support local businesses, I am even more so when they are organically certified by the Soil Association. As you may be tired of hearing by now, I am a long term supporter of the Soil Association, believing that they are ethically driven and offer the most rigourous organic standards that exist anywhere. They also campaign for more sustainable farming practices and higher quality food for all. This is especially true when it comes to egg production. Soil Association certified eggs must come from free range chickens that have proper outdoor access to grass. This not only leads to healthy and happy hens, but the eggs are better too. See my post on Ingredients are the Key and on duck eggs back along when I first started this blog. The chooks at Penbugle are all reared on the farm and have plenty of outdoor field space to run about in during the day. They have even more of it than the minimum required by the Soil Association. They also have access to indoor scratching and bathing areas as well as the nest boxes of course. What about foxes you may ask? The secret weapon in the Penbugle armoury are some rather gorgeous alpacas. Cute they may be, but they will not tolerate foxes in their fields and will drive them off and even kill them if they can. Oh and their fibre is rather lovely too. By a strange coincidence, I spotted a Penbugle stand at the Three Bags Full market, held on Friday to celebrate Liskeard’s wool heritage. They weren’t selling wool, but fibre from their alpacas instead. The fibre is not only very soft, but light, extremely warm due to the hollow fibres and hard wearing too – think of grandad’s camel hair coat. The following day, somewhat drenched after dancing the Community Scarf around Liskeard in the rain, I actually got to meet the Fox Patrol in person. They were taking part in the continuation of the Three Bags Full festivities along with some Penbugle sheep and a well dressed tractor courtesy of Victoria Knittingfairy. Thanks to Alison of Gingerpop Communications and to Lizzie of Penbugle Farm, I was sent a couple of dozen eggs to try out – just when I needed them most. I had several cakes to make for a friend’s birthday, culminating in this lime and pistachio layer cake. The eggs were large and as it turned out many of them were double yokers too – not something I’ve seen very often. I was determined to keep some back from the cake making, so we could try them au naturel. We had a couple of them boiled for Easter Day and a couple poached on another occasion. They tasted particularly good. CT being an avid egg eater is something of a connoisseur in these matters, so his thumbs up really means something. Penbugle Farm, is not only a working organic farm with rare breed cattle, sheep, pigs, hens, ponies and alpacas, but it also provides holiday accommodation in the form of wigwams and bell tents as well as tent pitches if you want to bring your own. So if you fancy a bit of glamping or even camping and a chance to get away from it all, this might well be the spot for you. Living in a particularly pretty part of Cornwall as we do, I can tell you it is well worth a visit. Most visitors to Cornwall charge down to the more well know western parts of the county, completely passing us by – it’s their loss. The farm is situated close to the pretty village of Duloe complete with its own stone circle. It is only five miles from the fishing village of Looe and the beautiful Cornish coast and only a few miles from Bodmin Moor. This provides plenty of good walking opportunities, wildlife spotting and a chance to explore our mining heritage. The farm is, of course, very close to my charming home town of Liskeard! Penbugle Farm are offering Chocolate Log Blog readers a 10% discount on any wigwam holiday plus a welcome pack of local produce, including their own organic eggs of course. To be eligible for the discount, just mention “choc log blog” when booking. To take advantage of this offer, holidays must be booked before 14th May and taken by the end of September 2013. How interesting about the alpacas! I did not know that! love alpacas… our neighbours have a few and they’re so soft…. love the double yolker eggs too… my favourite but The Viking won’t eat them! I dream of having alpacas one day – such gorgeous eyes and lashes! I completely agree with you about the Soil Association and eggs from real free-range hens. And it really makes such a difference to the taste too! You’re lucky to have such a lovely producer close to you. So interesting to hear that they use the alpacas to keep the foxes away – I’d never heard of that before!